Diamonds are forever, and as stone so hard it can cut other stones, diamonds represent the unbreakable and enduring bond of love. 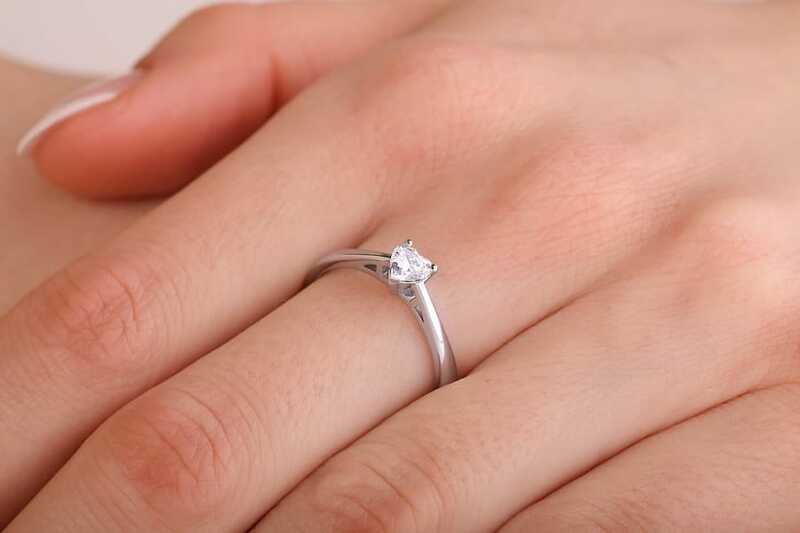 How better to show her your love than to give her a diamond ring? With many retailers and designs out there, the choice is yours. Here we will review the top five heart-shaped diamond ring designs, helping you to make the best choice for the one you love. Diamonds have been popular for centuries, as stones set in rings, necklaces and other jewelry. These stones represented the power and strength of kings, just as much as they stood for the softness and long-lasting nature of love. Giving the one you love a diamond ring sends the message that your love is strong and that the two of you intend it to last forever. Diamond rings come in many cuts, from the cushion cut to the princess cut to the increasingly popular heart-shaped cut. 1. What Is A Heart Shape Diamond? What is a heart shape diamond? These diamonds have been carefully cut by jewelers into a shape recognizable around the world, the heart, an unmistakable symbol of love. These diamonds are popular in rings and pendants, and their unique shape forms an attractive setting for the brilliance and luster of diamonds. Like other diamonds, heart shape diamonds can come in virtually any carat design, though a larger carat choice would make the shape of these diamonds unmistakable. These diamonds attract the immediate attention of anyone who sees them. 2. Who Would Love This Shape? With so many diamond cuts to choose from, what makes the heart shape cut so special? Choosing the right diamond shape is a matter of personal choice, but it should come as no surprise that the heart shape has grown increasingly popular. Unlike the more traditional round, cushion or emerald-cut diamonds, this diamond shape is rather unique and sends an unmistakable message of love. These diamonds are a good choice for anyone hoping to convey this message of love or for anyone looking to make a bold statement. 3. How To Choose The Right Diamond? 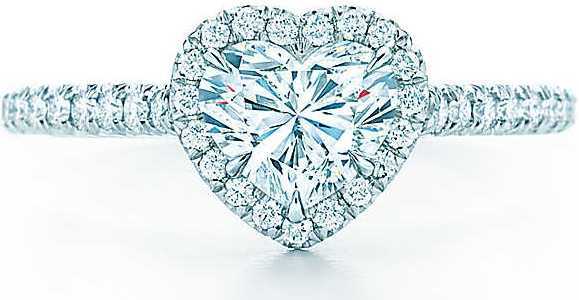 Diamonds shaped like a heart are unique, partially because much care has to be taken into achieving this shape. Another factor is that this shape is more noticeable in diamonds of a larger carat weight so that is something to take into account when choosing the right diamond. Carats above 0.5 are ideal for heart shape diamonds. Choose a diamond with symmetric sides; the wings should have a slight but clearly round shape, and of course you want to choose the right band or setting, considering perhaps other stones around the center stone to accentuate the cut. Although there will be similarities between retailers as they are all selling diamonds, choosing the right retailer can make a difference and, like anything else, is a personal choice. The retailers whose rings were reviewed here offered show-stopping designs that will make it very hard for the one you love to say no. 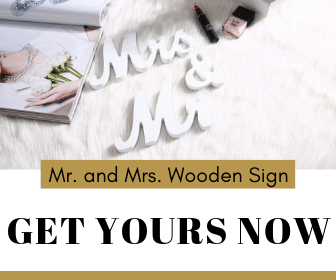 There will be no chance of getting stood up at the altar in these rings, whether you decide to go with a reasonably priced selection from Zales, or a more explosive offering from Tiffany. Choosing the right ring is not an easy choice, but we believe we made it easier for you with these retailers. It is hard to place a price on the right diamond, but these ring designs in 1 carat weights range from $4,499 to $26,700. There are many variables that must be taken into account when choosing the right diamond of this shape, and carat weight will naturally affect the price. Rings of this cut in smaller sizes will cost less while rings in large carats can demand significantly higher purchase prices. 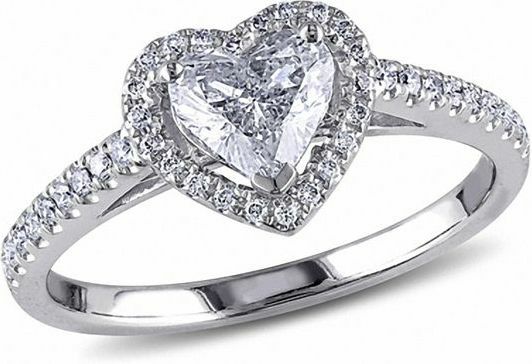 The rings offered by the retailers that were reviewed here were compared based on the quality of their design, their setting and the ability of the setting to set off the heart shape of the centerpiece. As mentioned above, stones of a smaller size may make it more difficult to appreciate the heart shape of these rings, but by reviewing rings of at least 1 carat in size, we ensured that we were not biased toward one ring or another. Price was also taken into account in the comparison. It is necessary to go into more depth on the setting of these rings. Many of these rings featured side stones, and these side stones often varied in terms of how they were ringed around the stone or set into the band. A ring described as having side stones may be very different from a similarly described ring from a different retailer, so we attempted to describe as best we could how the side stones were set and what the general effect of these stones was on the center stone, the centerpiece for the ring. Prices for heart shape diamonds range from $1,190 to $26,700, depending on both the diamond and setting. More expensive diamonds may be one of the magic weights. Diamonds that weigh 0.50 ct., 0.75 ct., 1.0 ct., 2.0 ct. or 5.0 ct. are worth much more than diamonds which weigh marginally less, such as 4.90 or 1.90 carats. Less expensive diamond rings will be either of a lighter carat weight, have a lower color grade or have more noticeable inclusions and blemishes. The settings themselves may also be of higher quality. This may include a more valuable metal band such as white or black gold or platinum instead of stainless steel or silver. 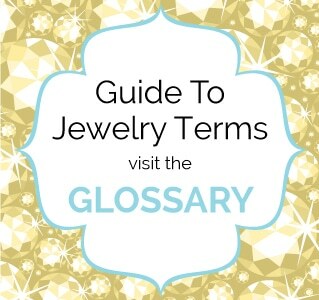 The setting may also include other gemstones besides the main diamond. If price is an issue for you, go for a lighter weight diamond which will reduce the sale price. Smaller diamonds make inclusions and blemishes harder to see, meaning you can get a diamond of lesser clarity which still look great to the naked eye. 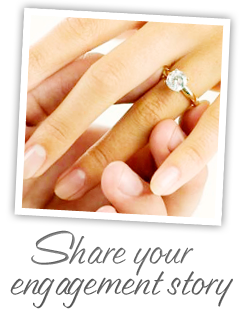 You can also choose a less expensive setting, such as a lower karat gold band. There are many high quality diamond engagement rings of this cut available on the market, and we tried to select those that were either of the highest quality, unusual or trend-setting, represented an industry standard or reasonably priced when considering their uniqueness and quality. We came up with a list of five from retailers with a well-regarded reputation for popular, quality rings. Some rings were similar to one another in design or type of band, while others were quite striking in the originality of their design, something not always easy to accomplish with an engagement ring, a piece that serves a very traditional function. This diamond engagement ring is offered by James Allen Rings. The white gold band and the numerous diamond side stones create a striking piece that will turn heads. The heart contour of the diamond is clear in this ring’s design, which is critical as side stones can detract from the shape or striking quality of the center stone. The side stones of this ring as well as the prongs that hold the stone in place are just the right size that they take nothing away from the shape of the center stone. The rose gold also accentuates the brilliance and cut of the stone. This statement piece is available for around $$. This piece from Jared has a unique design that carefully accentuates the shape and brilliance of the center stone. Who went to Jared? You did, and there this piece with its side stones gently increasing in size as they near the center caught your eye. This ring has a striking white gold setting perfect for the fashionable but soft-hearted trend setter or the cold and calculating ice queen. It is remarkable how well this design heightens the heart shape of the stone and Jared has another home run with this one. This statement piece from Jared is designed to warm the heart of your loved one and is currently available for around $. The band of a diamond ring, as part of its design, can merely be a backdrop for the stone or it can be its own statement piece. This ring, part of the Classic Winston line from Harry Winston, is very striking with a stone that appears to be propped up by two very large side stones. The platinum band has a modern feel that would fit in perfectly on the finger of someone who flies in private jets and is used to the high life. Perhaps the most original of all the rings featured here, this startling design from Harry Winston is one of a kind and sure to turn heads all around the world. This startling piece is available for $$$. For many, reputation is everything and when it comes to reputation few can compare to Tiffany. The Tiffany Soleste Heart is a very striking design that bears some superficial resemblance to the offering from Jared with its small band set with numerous lustrous side stones. Keeping with the trendy Tiffany brand, this ring is platinum rather than rose gold, and the heart shape center stone is itself surrounded by center stones. The numerous side stones diminish the shape of the center stone somewhat, but this is still possibly the most beautiful ring on this list, having a style that is both classic and modern. This show-stopping piece from Tiffany Soleste, part of the Tiffany and Company brand, is available in a platinum band for $$$. 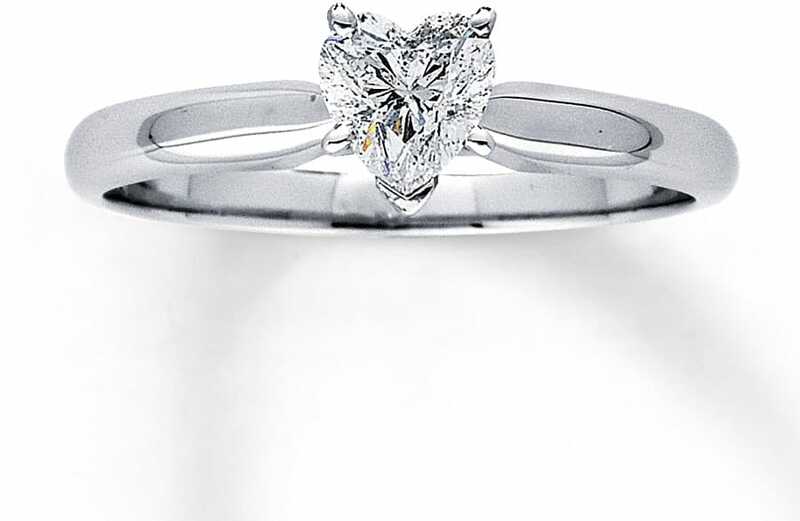 This ring offered by Zales has a diamond-heavy design that definitely brings the wow factor. This particular piece is offered in 14K white gold, which, like other rings on display here, perfectly accentuates the icy coolness and brilliance of the heart shaped center stone. This ring follows the pattern we have seen in some other rings: of a center stone with diamonds ringing the band. This ring resembles most closely the ring offered by Tiffany as the center stone is itself surrounded by side stones in a heart shape. These stones are set somewhat away from the center stone so as not to detract from the center stone’s unique contour. This classy piece set in 14K white gold is available from Zales at the very reasonable price of $. Rose gold also accentuates the brilliance and cut of the stone. Has a striking white gold setting. Has a stone that appears to be propped up by two very large side stones. Has a style that is both classic and modern. Has a diamond-heavy design that definitely brings the wow factor. Choosing the right heart shape diamond is a difficult choice, but cannot go wrong with any of these high quality pieces. Though there were some similarities in these sterling contestants, there were some standouts. 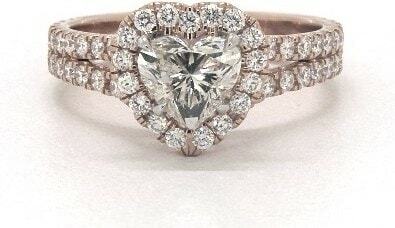 James Allen Diamonds offered a piece in rose gold that was classy, cute and relatively reasonable at about $6000. The pieces from Tiffany and Classic Winston were otherworldly, seeming to glitter in their own world of diamonds. Although the Tiffany Soleste ring was flashy and oozed the high life, the Classic Winston design on a platinum band with baguette side stones was so over the top that we would be remiss not to give them the nod.